SurvivorAU: Champions v. Contenders (2018) - 17th place, 8th out. Voted out in Episode 9 (Day 22). Champions v. Contenders Ep. 1 RC: Beats Commando Steve to win some rice. Both tribes win stuff. Champions v. Contenders Ep. 2 RC: "Sumo at Sea" - Beats Steve W again, but Contenders lose, 7-3. Champions v. Contenders Ep. 2 IC: Helps retrieve buoys; Contenders win. Champions v. Contenders Ep. 3 RC: Scores a goal, allows none vs. Jackie; Contenders lose, 7-4. Champions v. Contenders Ep. 3 IC: Helps haul the giant cart, and the Contenders win! Champions v. Contenders Ep. 4 RC: "Kicking and Screaming" - Drags Brian for a point, but Contenders lose, 3-2. Champions v. Contenders Ep. 4 IC: Chops the rope, helps push the ball; Contenders lose. Champions v. Contenders Ep. 5 RC: With Jenna, retrieves two balls with grappling hook, but Contenders lose. Champions v. Contenders Ep. 5 IC: Lands the Contenders' only ring, but Contenders lose, 3-1. Champions v. Contenders Ep. 6 RC: Loses to Commando Steve; Contenders lose, 7-2. Champions v. Contenders Ep. 6 IC: Helps carry the two cages & break the targets; Contenders win. Champions v. Contenders Ep. 7 IC: Competes twice, scores once; the Contenders lose, 3-2. Champions v. Contenders Ep. 8 RC: Runs three times, loses twice; Contenders lose, 3-1. Champions v. Contenders Ep. 8 IC: By the end, holding 2-3 bags, but the Contenders lose. Champions v. Contenders Ep. 9 IC: Waits a long time to work the vertical maze with Robbie; Contenders lose. Champions v. Contenders, Ep. 1: Matt Dyson (voted out, 7-5). Champions v. Contenders, Ep. 7: Tegan Gasior (voted out, 7-1-1). Champions v. Contenders, Ep. 7: One vote, from Tegan. Champions v. Contenders, Ep. 9: Seven votes, from Benji, Fenella, Heath, Paige, Robbie, Shonee, and Tegan (voted out, 7-1). Keep the tribe strong, the girls are weak, etc. The girls are weak, etc. Voting me out would be stupid! 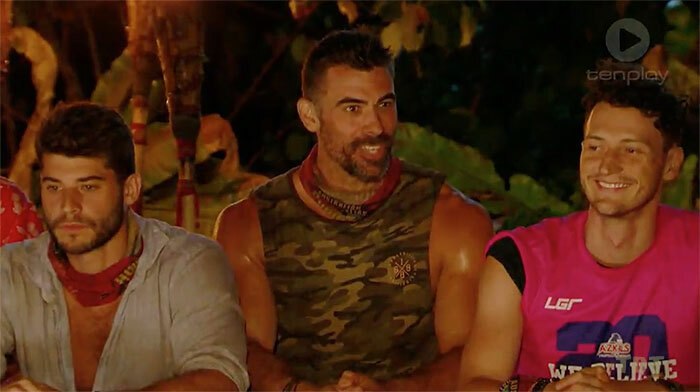 Mat Whitehead at TenDaily.com.au (8/20/18): "Zach Loves Watching You Unravel"
Kyle Dessent at 2 Boys Talk Survivor (8/20/18): "E09 Tribal Exit Interview"
Ryan Brink at Brink of Reality (8/22/18): "Vote Out Exit Interview (Episode 9)"
"Now working as a personal trainer, Zach first came to the attention of Australia as Hunter on the family entertainment television show, Gladiators. Zach hopes his fellow castaways will think he’s all brawn and no brain giving him an inside edge to win the title of sole survivor. “I’m a huge fan of the show, just like I was of Gladiators. All I wanted to be was a Gladiator. Did that. Now all I want to do is be a Survivor. As a hyper competitive individual, I relish the challenge and it’s the bragging rights of being Australia’s lone survivor. I love to compete and this game is the pinnacle." When he’s not watching Survivor with his wife, Zach is the captain of Australia’s number one paintball team which he built and recruited by himself. 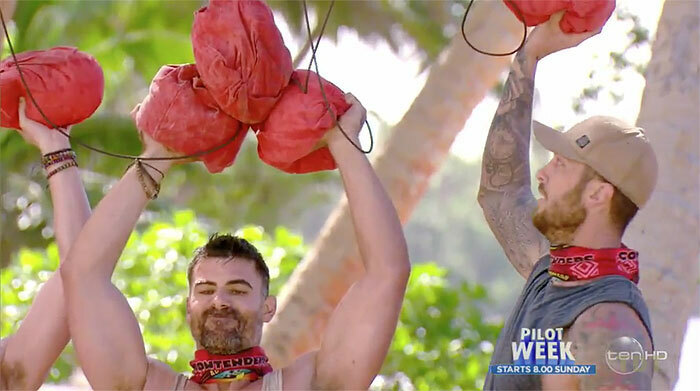 Although he feels he has the physical side sorted, Zach also thinks he has the mental ability to take on his fellow castaways saying, “I know how to make people feel good about themselves and to believe in the process. I think most people see fitness guys as big dumb idiots but I want to play smart.”"